Having done the hard work two weeks ago in Norway, United had to make sure that they did not let Stavanger back into this tie. 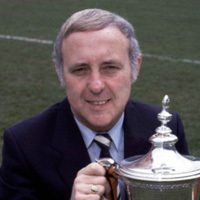 Although he had promised a few surprises in the line-up, Jim McLean more or less stuck to the same team from the weekends win over Dundee, except with John Reilly in place of Alex Taylor. The young midfielder, along with John Gardiner, Maurice Malpas, Derek Murray and John Clark, made up an extremely youthful substitutes bench, with the Terrors still missing the injured duo of Paul Sturrock and Eamonn Bannon. Reilly celebrated his European debut in the fourth minute when his pacy run down the left saw him find Billy Kirkwood with the cross, and only a late challenge from Brekke prevented Dodds from shooting United further ahead from the loose ball. Full-back Derek Stark set up Dodds for another chance in the 20th minute, but the strikers shot on the turn from 12 yards was directed straight at Johannessen. The Norwegians seemed content to contain, and Dave Narey came closest of all in the 26th minute when his ferocious 35 yard drive produced an outstanding save from Johannessen. Two minutes into the second half the 33 year old former international keeper was forced to produce his best again, when diving to touch an angled 20 yard volley from Dodds over for a corner. 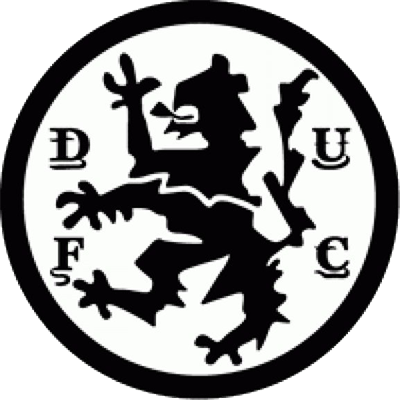 Having picked up a knock, Dodds was replaced by John Clark, who was making his first team debut for United, and with five minutes left, Stavanger skipper Bjarne Bernsten was sent off after taking a swing at Kirkwood. A frustrating evening by United's standards, but they progressed through to the 3rd round draw. Tannadice tonight hosts another European occasion with the visit of the current Norwegian champions. Viking Stavanger. Once again it is great to be involved in the European scene with the extra excitement it generates, and it is vital that we continue to make further progress in the UEFA cup. 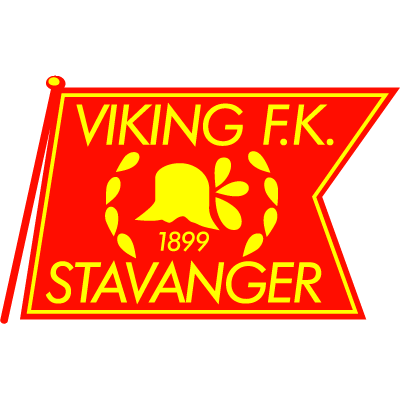 Viking are a very technically able side whose main strength lies in defence. It will be interesting to see what tactics they adopt tonight, in light of the two goal deficit they are chasing. My guess is that they will sit back and hope to catch us on the break, though I'd prefer that they attacked us to make the game even more entertaining for you, the fans. 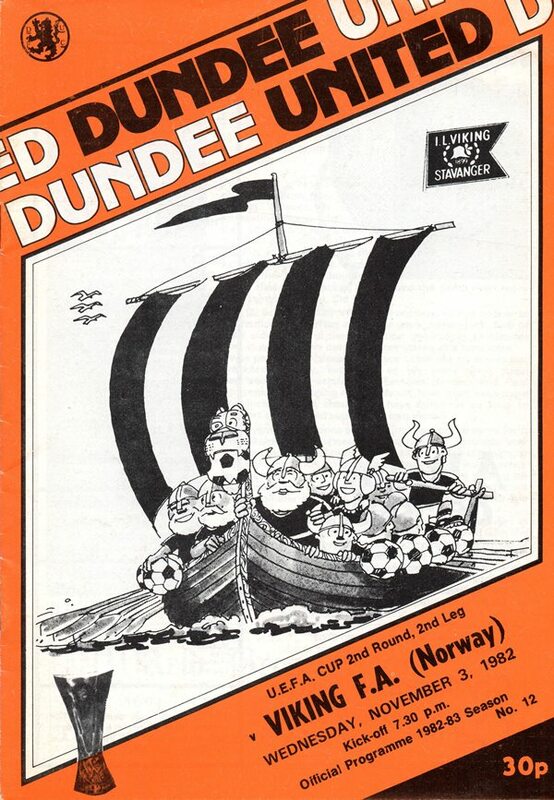 One tactic adopted by Viking will come as an eye-opener to Tannadice fans. When ever they get a corner kick, five of their side surround the opposition goalkeeper to distract him, it is a ploy we ourselves may utilise at a later date. I was particulariy pleased that we came out on top in last weekend's derby, especially as we were once again deprived of the services of Eamonn Bannon and Paul Sturrock. The winning margin should have been even more convincing and it should not have taken us so long to convert our outfield superiority into victory. This evening I will once again be looking for the same form from Ralph Milne whose performance last Saturday was outstanding, his final pass being the flaw. Ralph is assuming the positive mantle normally associated with Paul Sturrock and Eamonn Bannon. In their absence we are relying on Ralph more and more, as he is the most positive player we have available and it is vital he continues to get to the bye-line. You may be surprised there are so many young players in tonight's pool. It needs no explanation, for coupled with the injuries to Paul Sturrock and Eamonn Bannon, the other fringe players have failed to respond to the challenge,and its long past time one or two of them moved on. It has however been impossible to attract interest from other clubs with the form they have displayed recently.